1. Soak the dried mushrooms in 3 tbsp boiling water. Meanwhile, bring a saucepan of water to the boil and cook the linguine for 10 minutes until tender. Combine the garlic, chilli, olives, most of the parsley, lemon juice and 2 tsp of the olive oil in a small bowl. 2. Heat the remaining oil in a frying pan and fry the chestnut mushrooms for 5 minutes until golden. Drain and chop the dried mushrooms, reserving the liquid. Add both to the pan and cook for 1 minute. 3. 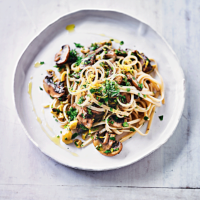 Drain the pasta, return to the saucepan and add the chilli verde and mushrooms. Heat through for 1 minute and pile onto serving plates. Sprinkle with the remaining parsley and lemon zest and serve.